Oscar De La Hoya is currently out in Kuala Lumper, attending the Manny Pacquiao-Lucas Matthysse fight week goings on, and at the final press conference to further hype this Saturday’s WBA welterweight title fight The Golden Boy had some interesting things to say about Pacquiao, the man he of course once fought – and lost to, badly. “I hope not,” was De La Hoya’s answer, as quoted by Inquirer.net. As fans know, we had to wait the longest time to finally get to see the two finest pound-for-pound fighters of their era get it on, and by the time Mayweather and Pacquiao did meet, it resulted in a dull fight won widely on points by Mayweather. Had the two fought in, say, 2009 or 2010, and not 2015, who knows? Is De La Hoya right, on both counts: did Manny have a better overall quality of opposition compared to Mayweather, and would Pac Man have beaten Floyd had they met years sooner than they did? 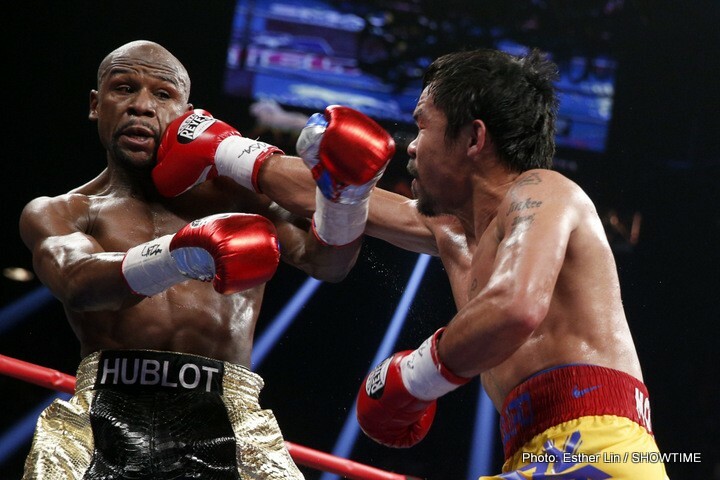 I don’t know about it being easy, but for what it’s worth, I agree with De La Hoya – a 2009 to 2010 version of Pac Man proves too fast, too lethal and too damn good for the pot-shotting Mayweather. As Oscar says, there’s a reason Mayweather waited so long to finally face the biggest threat to his perfect, unbeaten record. Next boxing news: Tyson Fury and Luis Ortiz land “safe” opponents – wouldn’t it be great if they were fighting each other!